and the simple act of running out the car had me longing for Spring. and when I say as is, I mean clothed. 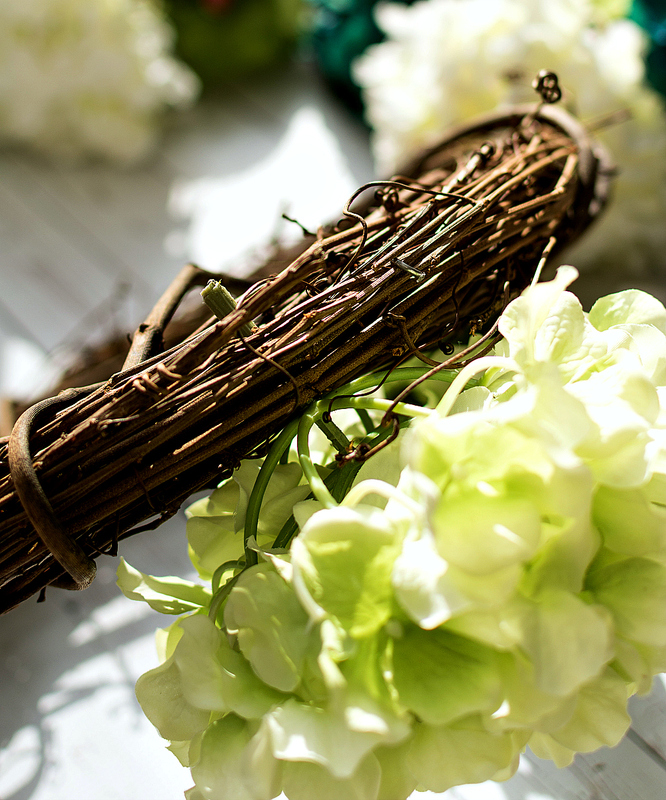 I found the faux hydrangeas, twig wreath form, and green floral wire at Michaels. I removed the leaves and cut the stems 1 1/2 inches in length from the bloom. 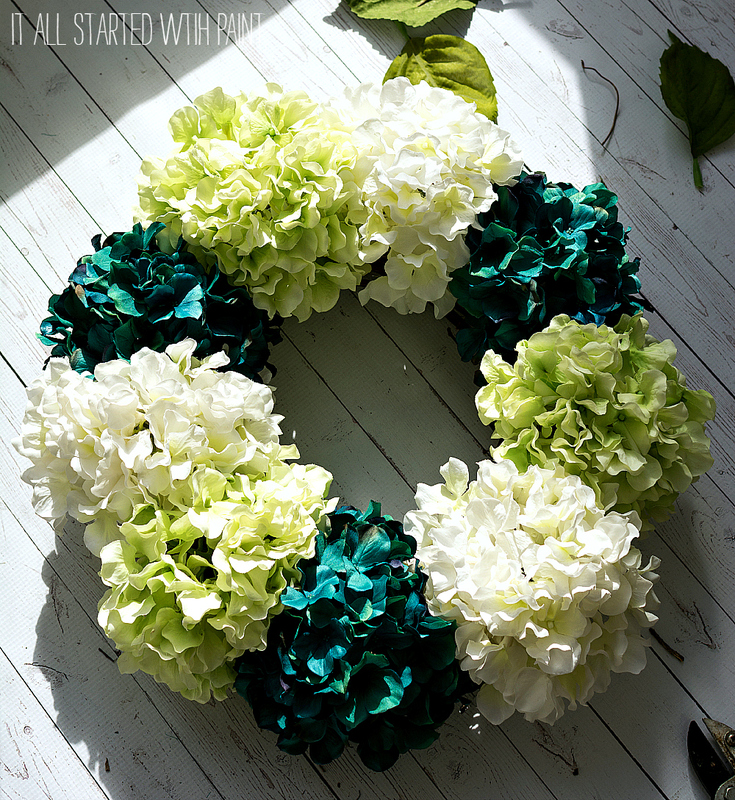 I just moved around the wreath, adding hydrangeas in alternating colors. I used 9 total. I toyed with adding a border of leaves around the edge, but in the end preferred this clean look. The finishing touch was a green bow. I actually attached the bow to the window pane and the door muntins using Scotch restickable dots for mounting. 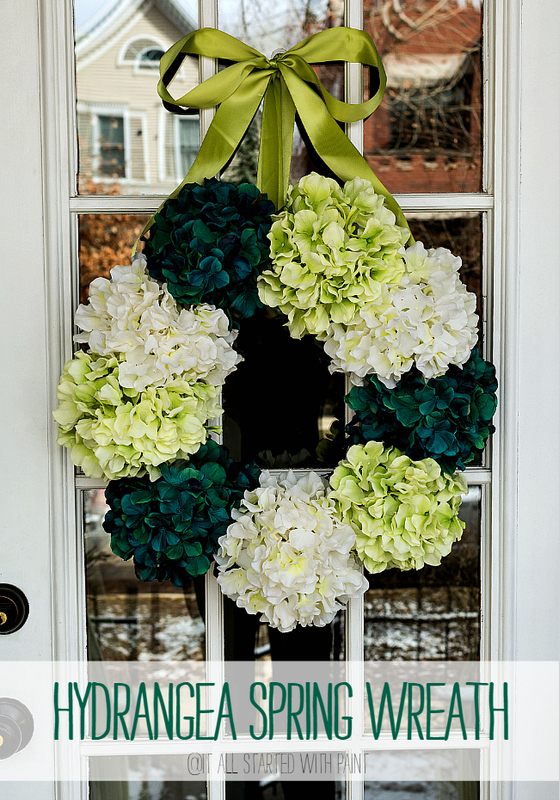 Now if the snow would just melt and the temperatures would warm up so the grass can grow as green as my new Spring wreath! Have a wonderful weekend! 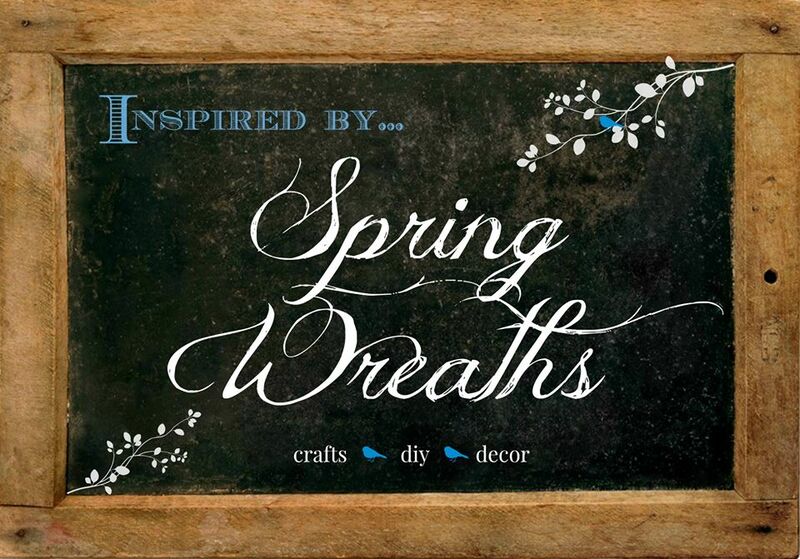 Here’s hoping Spring wreath making … and Spring weather … is involved! who you kidding…get some clothes on! 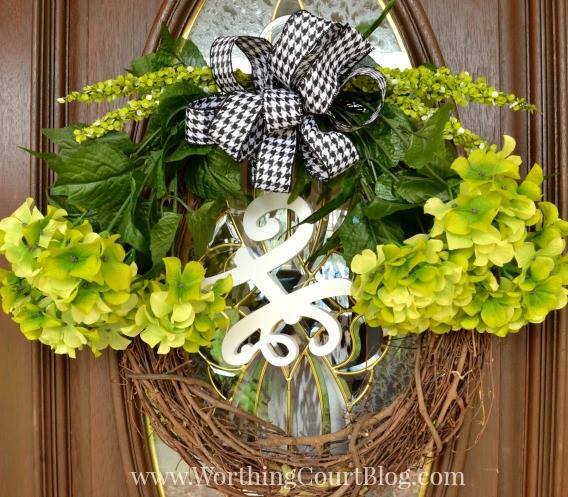 lovely wreath, hydrangeas are some of my fav flower. Hope you have a great weekend. Maybe if it warms up, you can clean your car out! I wish I were a talented wreath maker, but it seems that this and paper crafts are my Achilles heel. 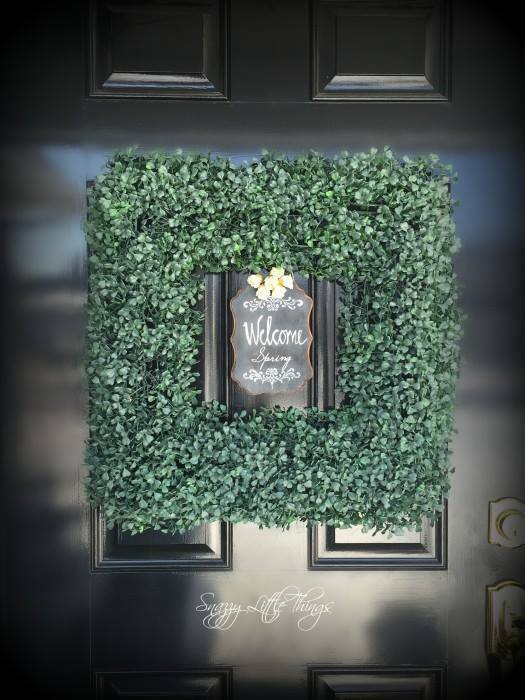 I love what you’ve done here – I do reserve flowered wreaths for when the weather actually turns…and right now it’s 12 degrees with snow on the ground. Thanks for the compliments on my wreath – I still think it’s a tad ‘wintery” but I will try your method once I’m rewarded with warm weather! LOL, for a minute there I thought you were describing a) my own vehicle and b) my own state of dress (or undress.) 😀 Its good to know we bloggers share many of the same traits. Hah! I was looking at those dark hydrangeas and wondering where I could get the plant that grew that beautiful color! Wow Linda, awesome wreath as are all the others featured. 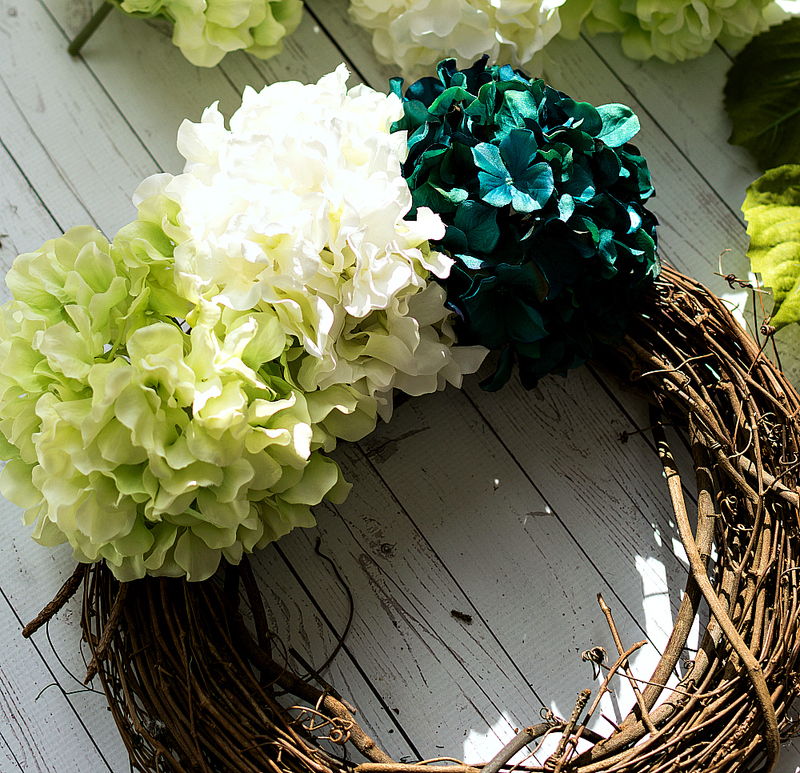 Love how you alternated colors of hydrangeas on your wreath, great to just stick them into wreath for reuse. Loved that you didn’t add anything else to your wreath, it’s the gorgeous hydrangeas, my favorites are the dark colored ones. Is there a hydrangea plant that grows that color? So pretty and mysterious looking. I’ll have to take another look at Michaels flowers, on sale this week weren’t they? WE were at dog park in G.J. last Sunday, met a couple that had just moved here from Chicago, he was so happy with how nice it was. So sorry it’s been tempermental there, not warming up. I won’t tell you how it is here. Will you get hot weather when it does warm up or does it take it’s sweet time acting like Spring? Used to take while to warm up in MT. I store whole bunch of things in our old 89 Suburban, doesn’t run so might as well get storage out of it. Every once in while I go out to clean it out, find things and there goes the neat old truck. Think most of my good Easter stuff is out there so need to go digging. Hubs says there’s enuf Easter out on tables now. I bought few more little things at Habitat, Goodwill, and Salvation Army thrift stores, just can’t seem to resist cute little bunnies, what can I say? Since hubs got his upper teeth out on Monday, been even harder finding things he can eat, he’s fussy too. Might be while before he gets his false teeth. 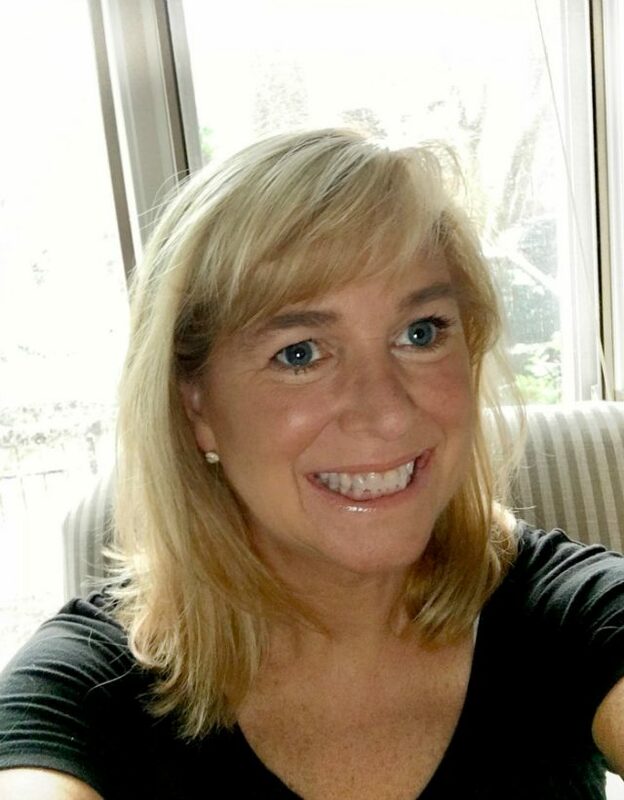 I”ve been without my bottom teeth for over year. I lost bone and teeth at same time. No dental insurance. Our dishwasher went out other day, our garbage disposal last week, what next? We need a higher powered router due to my new pc having features that need it. Will have to wait til next payday. Afraid to even think about it. Better get going, fold towels from dryer, hung my jammies out on lines. Hope you have good weekend even if it’s cold/snowy. i love your wreath!!! Hydrangeas have always been a favorite. The green ribbon is just the perfect added touch! So fun touring with you each month! Yes…yes, this weather really makes no sense for those of us who go shoeless (and sockless) most of the time. But Yay! 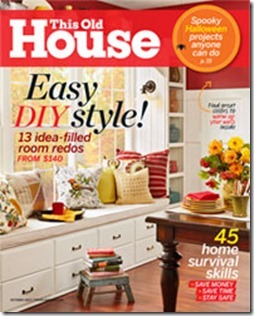 A project I can do! After the Easter egg wreath comes down, I’m at a loss! By the way, neighbor…my daughter just moved to Lakeview. Is that near you? I just love your wreath, Linda. I especially love the alternating colors of the hydrangeas. And using a satin ribbon as a hanger is the perfect touch. Linda, your wreath is stunning! I love the colors you chose…beautiful! 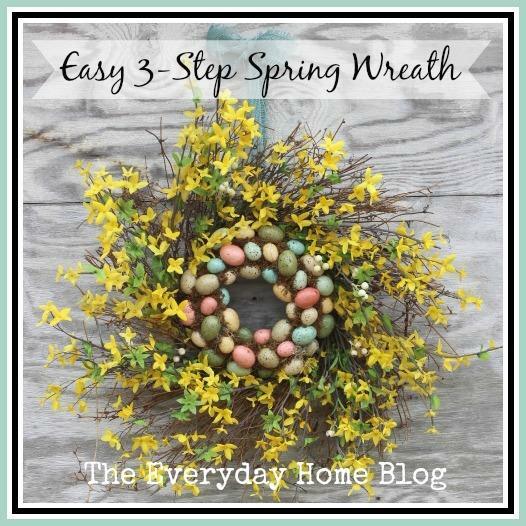 I’m not much of a wreath maker, but with your helpful tutorial, I think I can do this!!! 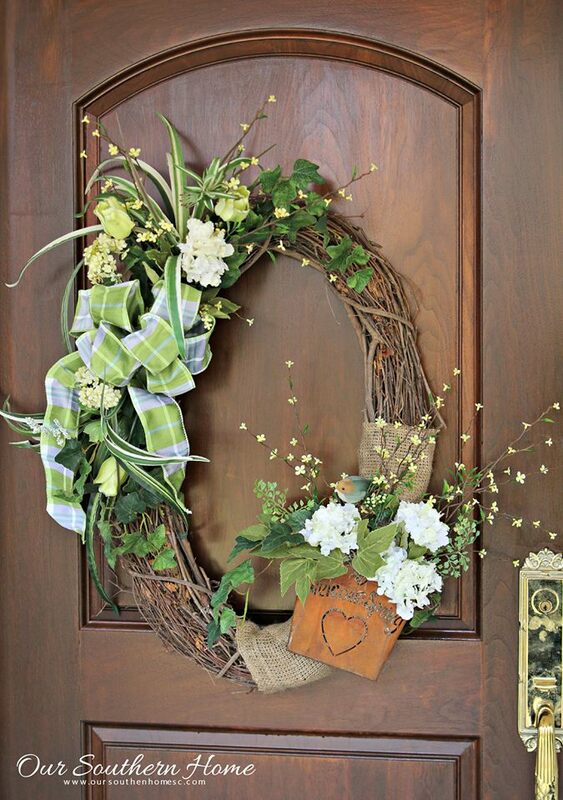 Did you use an 18 inch wreath? Thank you for sharing your lovely creation! Thank you so much! 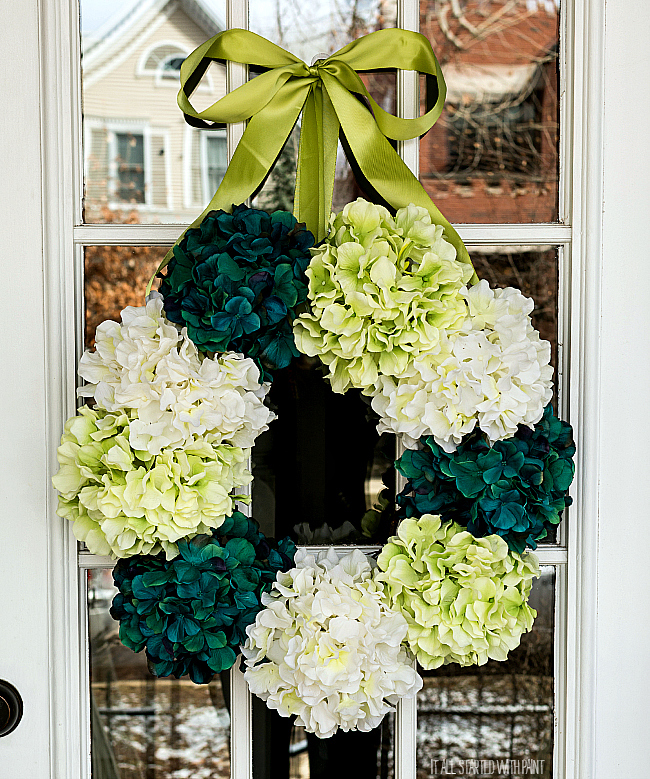 My wreath is more like 14″ The hydrangeas help to fill it out larger. Plus my front door isn’t very wide. 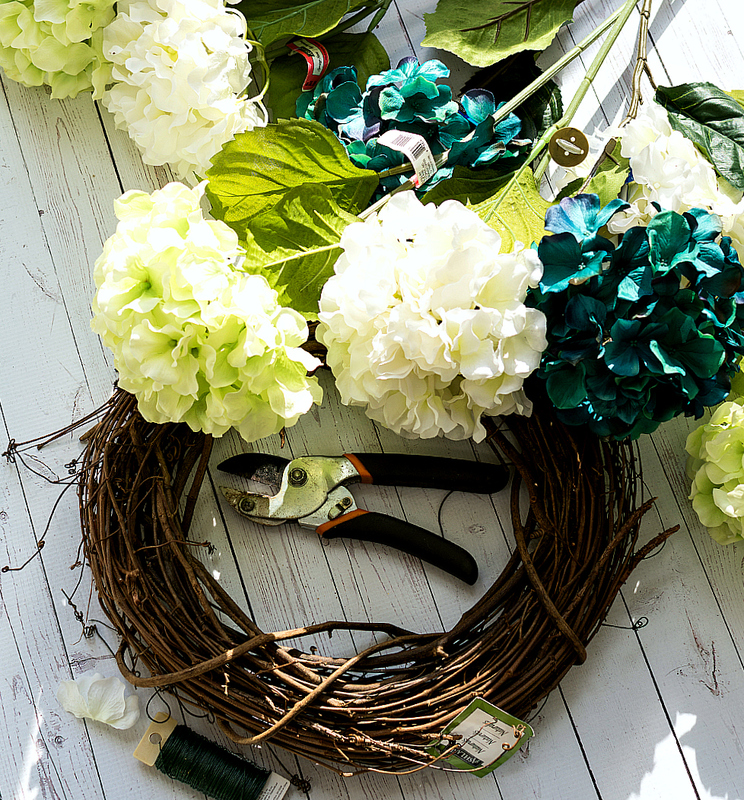 Love your hydrangea wreath!! and definitely will try to recreate it for my door. Did you use the green floral wire for anything? Maybe the hanger? I don’t want to miss a step ? 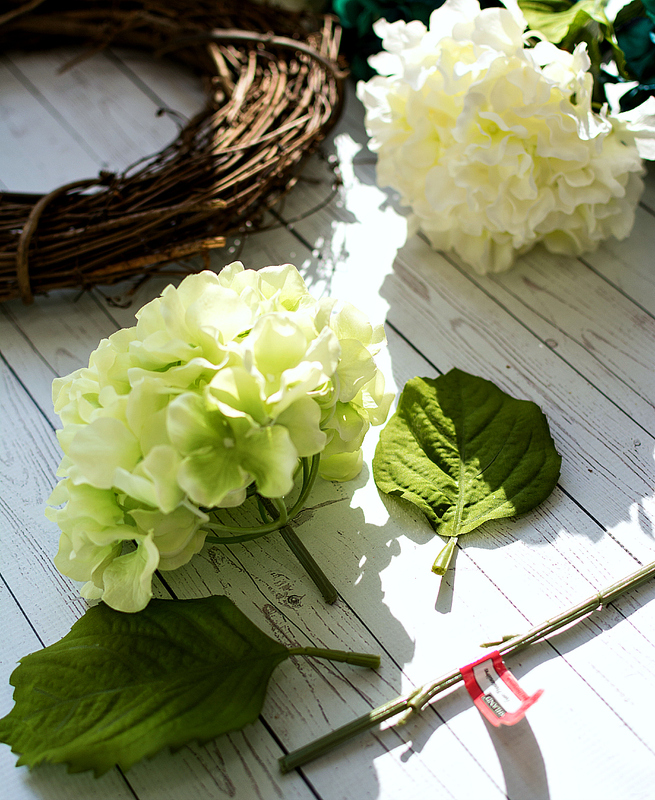 All the Spring wreaths you showed are lovely but I have to say the hydrangea is my favorite only because hydrangeas are in the top three favorite flowers of mine. Thanks to all who generously share their talent.